BOSTON - Four points from captain John Stevens and 32 saves from Ryan Ruck set the tone for the Northeastern men's ice hockey team, which potted four power play goals en route to a 6-2 victory and series sweep in the Hockey East first round against Connecticut on Saturday night at Matthews Arena, 6-2. The win sends Northeastern into the Hockey East quarterfinals for the 24th time in program history, and third time in the last four seasons. The Huskies will travel to either UMass Lowell or Boston University for a best-of-three series next weekend, depending on the result of Sunday's New Hampshire-Merrimack game. With Northeastern leading 3-2 through two periods, UConn was assessed a five-minute major for contact to the head midway through the final frame, giving NU an extended power play. That's when the Huskies put the game out of reach, scoring three times in a span of four minutes to take a commanding four-goal lead late in regulation. Stevens finished the night with two goals and two assists, while Zach Aston-Reese (one goal, one assist), Dylan Sikura (two assists), Nolan Stevens (two assists) and Garret Cockerill all logged multi-point nights. Aston-Reese scored his 30th goal of the season on Saturday night, becoming the ninth Husky to pot 30 in a season in team history, and first since 1985-86. His 62 points lead the nation and are seventh in Northeastern single-season history, while his 30 goals also lead all NCAA players and are tied for eighth in a season in team history. Northeastern took an early lead on a goal from Brendan Collier 4:09 into the game before Aston-Reese gave the hosts a two-goal lead midway through the second period. A pair of UConn goals from Brian Morgan and Miles Gendron bookended a power play tally from Adam Gaudette to send NU into the locker room with a 3-2 lead. The five-minute major to UConn proved to be the turning point as Northeastern scored three times in a span of 3:39 to put the game away with a pair of goals from John Stevens and a final strike from Jeremy Davies. Ruck was solid between the pipes for Northeastern all weekend long, finishing off the series with 32 saves, including 23 in the final two periods. Adam Huska made 28 stops for Connecticut. Shots were even at 34 apiece while Northeastern went 4-of-6 on the power play and held UConn to an 0-of-2 showing. - Northeastern bolted out to a 1-0 advantage less than five minutes into the game on Collier's second of the weekend. Off a face-off in the attacking zone, Matt Filipe jockeyed for position in the dot, allowing Lincoln Griffin to poke the puck out to Collier at the left side. Collier quickly settled the puck before ripping a wrist shot short side for his fifth of the season. - The Huskies extended the lead to 2-0 with 11:54 remaining in the second period on Aston-Reese's 30 goal of the season. As the Huskies transitioned up ice, John Stevens hit Nolan Stevens with a pass on a two-on-one rush. Nolan's shot from the left dot was stopped by Huska, but Aston-Reese was trailing the play and cleaned up the rebound for the score. - Connecticut brought the game back to a one-goal contest with 7:40 to go in the frame on Morgan's seventh of the year as the Huskies potted their own goal in transition. After Huska knocked down a shot from the right side, Corey Ronan skated the puck out of the defensive zone before dishing to Max Kalter flying up the right side. Kalter entered the attacking end and fired a low shot in on Ruck's pads, allowing the rebound to pop right out to Morgan on the left post for the tap in past Ruck. - Northeastern quickly regained its two-goal lead just 2:10 after the Morgan strike with a power play goal from Gaudette. As the Huskies moved the puck around the UConn zone, Garret Cockerill sent the puck across the John Stevens at the left point. Stevens then saw Gaudette stationed at the bottom of the left face-off dot, and tossed a pass down to him for a one-timer that beat Huska over the shoulder for Gaudette's 26th of the year. - Connecticut cut the deficit in half with 1:59 to go in the frame when Gendron potted his fourth of the season, collecting a pass from Johnny Austin and shooting a low puck towards the cage. The puck caught the skate of a Husky defender and popped up into the air and over Ruck for the score. - Northeastern put the game away with a three-goal third period, all on the power play, with the first coming from John Stevens with 8:47 to play in regulation when he received a pass from Cockerill in the slot before ripping a wrist shot over Huska's blocker for his fourth of the year. - Stevens found the back of the net again just two minutes on a similar play as Sikura fed Aston-Reese atop the crease before Zach slid the puck back up to John, who let a snap shot go from between the hash marks for his second of the game. - Davies got into the action with 5:08 to play in the game during a scrum in front of the Connecticut goal as Eric Williams' shot was knocked down by Nolan Stevens before the rebound slid over to Davies, who pounded it home for his eighth of the season. - The Huskies advance to the Hockey East quarterfinals for the 24th time in team history, and third time in the last four seasons. - Aston-Reese moved into a tie for 12th place on Northeastern's all-time scoring list with 147 points, into a tie for 12th on the program's career goals list (65) and into a tie for 18th in career assists (82). - Aston-Reese is seventh on Northeastern's single-season points list (62) and tied for eighth in single-season goals (30). - Aston-Reese (30-32-62), Gaudette (26-26-52) and Dylan Sikura (20-36-56) have combined for 170 points this season, which is the third highest point total from three skaters in a season in Northeastern history. 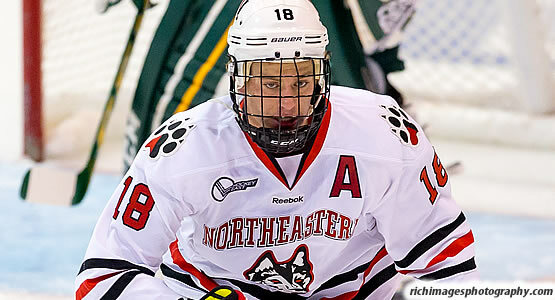 - Gaudette padded his school record for power play goals in a season to 16 on Saturday. - Filipe has four assists in his last three games, and now has 20 points on the season (nine goals, 11 assists). He's the second NU rookie to reach 20 points this year (Jeremy Davies). - Nolan Stevens extended his point streak to five games (three goals, seven assists), while John Stevens has three points in the last two games. - Northeastern will travel to either UMass Lowell or Boston University for a best-of-three quarterfinal series next weekend, depending on the result of the New Hampshire-Merrimack game.